HELP OUR PATRONS PARTICIPATE IN IMPROVING OUR ENVIRONMENT BY PATRONIZING BYO BOWLS. 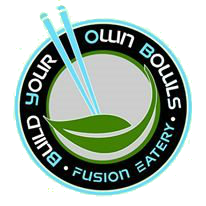 BYO Bowls, pronounced Bio-Bowls is a modern, quick-service fusion eatery that provides guests the ultimate in custom made, guest created, healthy dining. We stand behind our passion of being the Communities Quick Serve Restaurant CQSR. BYO Bowls will provide guests with limitless options through creative control of their Build-Your-Own-Bowl meal, offering the freshest available ingredients, with flat fixed pricing. The freedom of choice to pick from the freshest ingredients is appealing to guests and provides healthy options with craveability. Guests will appreciate the creative control to go healthy without compromising flavor. Consumers will favor the transparent pricing of BYO Bowls and will leave healthy, happy, and satisfied for about $8.00-$10.00. A strong User-Built system is BYO Bowls greatest asset that is currently unavailable in Hawaii. Guests will creatively build their own custom Stir-Fry, Fried Rice or Salad Bowl from a bountiful buffet where they will find a huge, nutritious, selection of fresh produce, exotic noodles & rice, dressings and flavored oils. Once guests build their own unique one-of-a-kind masterpiece, they will move to the open display kitchen where they will hand over their filled raw bowl to the BYO Bowls Kitchen Team. Here the guest is offered a choice of protein (standard or organic) as well as one (or more) of our enticing variety of finishing sauces. Our BYO Bowls Chef will then prepare each individual creation on our open Teppanyaki style grill. BYO Bowls has a responsibility to provide the freshest available ingredients straight to our guest’s bowl, to the grill, to the plate in just fewer than five minutes. A premium line of organic vegetables Farm-To-Table and proteins / Pasture-To -Plate will provide even the die-hard customer the purest of experiences. BYO Bowls will be able to cater to Gluten Free Customers and Vegans alike. BYO Bowls wants to be the first to offer sustainable food in the Asian stir fry BBQ segment. This will be one of many competitive advantages BYO Bowls will hold in this sector. Unfortunately, it is cost prohibitive to be 100% organic at this time, but BYO Bowls can increase its offerings of more sustainable vegetables and proteins as inventory and demand levels increase and prices decrease. There will be no deep fry, grease, lard, or precooked preparation. Customers will appreciate the daily prepared, fresh, raw cut vegetables and butcher quality meats cooked right to perfection in front of them in an open style kitchen. Other offering that sets BYO Bowls apart from the rest: BYO Bowls will also take advantage of the huge trend in Custom Poke Bowls by offering a Custom Poke Bowl Station. Guests can proceed directly to this station and have our BYO Kitchen Team assemble a made-on-demand Poke Bowl precisely to our guest’s desires. Choose from Ahi, Tako or Tofu and mix in your choice of sauces and fresh ingredients. Place on top of Sushi Rice or Brown Rice and top with an assortment of delectable options such as Furikake, Nori, Fresh Ginger and Creamy Sriracha Sauce. In the beverage department Byo Bowls will have fresh squeezed lemonade regular or add a splash of alcohol. Finally, Bubble Teas will round out the beverage offerings providing the young at heart with a sweet selection of tapioca pearls and flavored jellies.